Yes, you can go back! The First Team: Pacific Naval Air Combat from Pearl Harbor to Midway. H.M.S. QUEEN MARY. Iron Shipwrights. 1/350th resin. 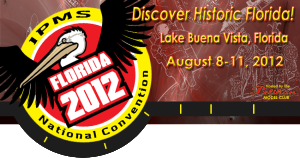 The 2012 IPMS USA Nationals were held in Orlando, Florida on Walt Disney World property. Overall it was a great time, and the show seemed to have a large turnout. From a purely attendee point of view, it all went smoothly, and the facilities were top-notch. Below is a slide show of my photos from the event. I did not even attempt to photograph everything on the tables. It’s a collection of what I thought was cool, and what showed exceptional craftsmanship.